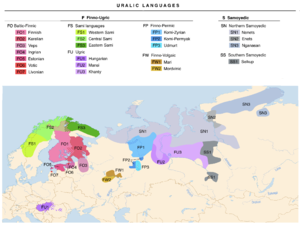 The Uralic leids (whiless cried Uralian leids) constitute a leid faimily o some 38 leids spoken bi approximately 25 million fowk, predominantly in Northren Eurasie. ↑ Nordhoff, Sebastian; Hammarström, Harald; Forkel, Robert; Haspelmath, Martin, eds. (2013). "Uralic". Glottolog. Leipzig: Max Planck Institute for Evolutionary Anthropology. This page wis last eeditit on 14 Julie 2016, at 21:43.